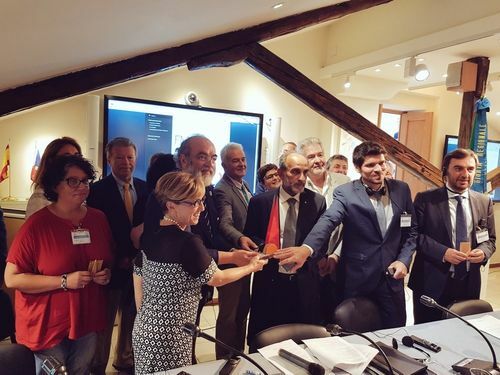 The Intermediterranean Commission (IMC) of the Conference of Peripheral Maritime Regions (CPMR) has been presented with a prestigious Mediterranean award for its work supporting cohesion and regional development in the Mediterranean. The world-renowned award, which is presented by the highly-respected network for peace and dialogue, Fondazione Mediterraneo (FM), has since 1996 been given to eminent people or organisations from the worlds of arts and culture, politics and science and social disciplines, whose actions have contributed to reducing tensions, breaking down cultural barriers and developing shared values in the Greater Mediterranean. The CPMR IMC has been given the Mediterranean Award 2017 in the category “Institutions” for its collective efforts and actions towards cooperation, cohesion and regional development in the Mediterranean basin. Presenting the Award, the FM cited the work carried out by the IMC and its political commitment in the framework of emerging strategies, migration and citizenship, as well as in sectoral policies like maritime issues and transport, economic and social cohesion, water, climate, energy etc. It also highlighted the wide range of advocacy actions and cooperation projects that the organisation is currently promoting, together with different types of Mediterranean stakeholders in a multilevel governance perspective. Accepting the award from the FM’s President Michele Capasso, Mr Apostolos Katsifaras, Regional Governor of the Western Greece Region, and President of the CPMR Intermediterranean Commission, said: “We are proud to receive this highly coveted and respected award which recognises the CPMR Intermediterranean Commission’s significant achievement in fostering solidarity and collaboration across the Mediterranean. 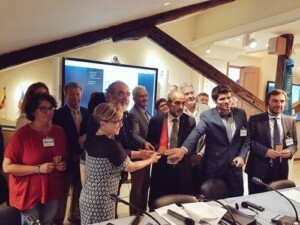 The award was presented to the Intermediterranean Commission during its General Assembly, held in Naples, Italy, from 6-7 July and hosted by its Vice-Presidency, the Region Campania. During the meeting, the Commission’s Mediterranean member regions outlined their key political priorities, including the need for a coordinated strategy to deal with the deepening migration crisis, the importance of a reformed Europe built on solidarity and cohesion, and the necessity for multilevel Mediterranean cooperation. A political declaration was released addressing all the main challenges and including specific recommendations. Read the full explanation for the award, the full motivation of the award, and see the photos and videos on the web site of the Fondazione Mediterraneo and on its Youtube channel. 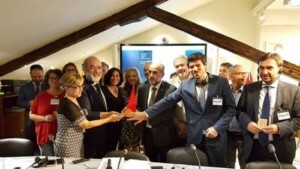 The Fondazione Mediterraneo is a non-profit network promoting dialogue and peace in the Mediterranean areas and around the world, monitored by the Italian Government and involving public bodies and local governments. It includes specialists and internationally recognised scholars on the Mediterranean, and politicians with international and diplomatic experience.